Belfast is the capital city of Northern Ireland and is the second largest city. Historically, Belfast has been a centre for the Irish linen industry, tobacco production, rope-making and shipbuilding. The city's main shipbuilders, Harland and Wolff, which built the ill-fated RMS Titanic, propelled Belfast in the early 20th century as the largest and most productive shipyard in the world. The city suffered greatly during the period of disruption, conflict, and destruction called the Troubles, but latterly has undergone a sustained period of calmness and substantial economic and commercial growth. Belfast city centre is now on the map as a must to see. 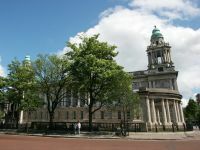 A must while in the city - visit includes the city centre, shipyards where the RMS Titanic built and launched, University Quarter, Museum district and much more. Spanning a chasm 80 feet deep, this seasonal bridge is used mainly by local salmon fishermen to reach their nets on a small island just off-shore. The bridge is now a popular tourist attraction, with the brave visitors crossing the bridge! The trail to the bridge has fantastic views of the Antrim Coast, Sheep Island, Rathlin Island and also Scotland. Created over 60 million years ago after intense volcanic activity. 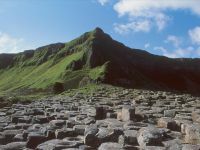 From this World Heritage Site, you can enjoy spectacular views of the North Antrim Coast and Scotland on a clear day. Dates back to the 14th Century as the home of Richard De Burgh. It is home to the Wishing Well and Mermaids Cove and is perched above a massive sea cliff and with fantastic views of the northern part of Ireland (as far as Donegal) and the Antrim and Derry Coast. The oldest licensed whiskey distillery in the world and in the small village of Bushmills. Take a guided tour and see how the whiskey is made from local water and how it became known as 'The Water of Life'. - don't forget the whiskey tasting session!